Gain a deeper understanding of the meaning and messages of the revelations given inThe Harbinger. · The HISTORY section, which gives a brief summary of the week's reading along with more details on the historical facts that were revealed in the narrative, giving more context to the passage being read. · The MYSTERY section, which provides biblical resources and verses for more in-depth study of the topics brought up in the reading and includes questions for individual reflection or group discussion. The CALL section, which includes a prayer focus that complements each week's mystery and instructions for continuing the application of the important truths from each week. This section ends with a scripture, motivating you to write God's Word on your heart and to grow in your knowledge and understanding of the repentance needed for our nation in this crucial time. 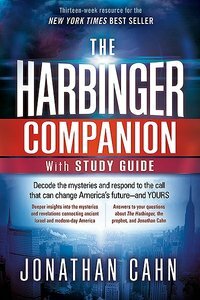 About "The Harbinger (Companion & Study Guide)"